Every garden needs a practical, good looking timber shed for storage of tools and other garden equipment. The larger garden may require a larger building which can be used as a workshop or a mobile office. Garden buildings can be made to any specification but are usually bulky and can be awkward to install. We offer a full design, supply and installion service on all types of garden buildings. The simplest and least-expensive sheds are available in kit form. Both shed kits and "do-it-yourself" plans are available for wooden sheds. For homes with small gardens or modest storage needs, there are several types of very small sheds and storage units. The sheds not only use less ground area but also have a low profile less likely to obstruct the view or clash with the landscaping. These small sheds include corner sheds, vertical sheds, horizontal sheds and toolsheds. When a shed is used for tool storage, shelves and hooks are often used to maximize the storage space. Metal sheds made from thin sheet metal sheathing (galvanized steel, aluminium, or corrugated iron) attached to a metal frame. Metal sheds are a good choice when long-term strength and resistance to fire, rot, or termites is desired. However, metal sheds may rust over time, particularly if they are constructed from steel that is not galvanized. Be aware that concrete is highly corrosive so care needs to be take when assembling your shed to avoid contact with the outside panels. As well, some types of metal sheds that have thin walls are easily dented, which may makes some types of thin metal sheds a poor choice for vandal-prone areas or for high-traffic activities such as small businesses. In cold climates, metal sheds with thin walls need to have snow and ice cleared from the roof, because the thin metal may be damaged by a heavy accumulation. Since thin metal sheds weigh much less than wood sheds, thin metal sheds are more at risk of being damaged by heavy winds. To prevent wind damage, thin metal sheds should be attached to a concrete foundation with screws. Wooden sheds have a natural look that can blend in well with garden environments. Despite the strength of wood, over time, untreated and neglected wood can rot, split, warp or become susceptible to mold and mildew, so wood sheds should be treated for protection. Wood sheds need regular maintenance. This includes keeping plant matter and debris from piling up beside the walls and on the roof, and occasional rot-proofing with preservative. Sheds are sometimes also re-stained or varnished at times for aesthetic reasons. Fire and, in some regions, termite attack are also potential problems. Stains and preservatives can be applied to wood sheds to prevent damage to the wood caused by exposure to rain, damp ground, UV light, harsh climatic conditions, fungal attack and wood-boring insects. 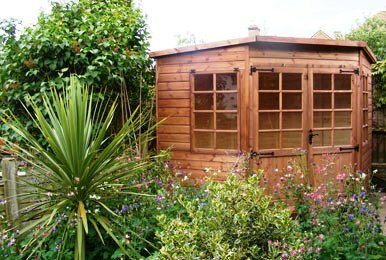 If a coloured preservative oil or stain is used, a wooden shed can either be made to stand out as a feature within a garden, or to blend in with its surroundings. Red cedar coloured stain is popular. Some types of wood, such as cedar, are more naturally resistant to water damage. One advantage of using wood sheds is that it is easier to modify wooden sheds (i.e., than metal sheds) by adding windows, doors, shelving, or exterior trim (etc.) because wood can be cut and drilled using commonly available tools. Some homeowners may prefer wood sheds because wood is a renewable resource.